Founder Rafael Jimenez of NYC-based Latino and multi-ethnic men’s streetwear brand Republica Trading Co. volunteered to have his site reviewed. That was a good call because the site misses the mark when it comes to SEO in some key areas. Before even loading the home page, I uncovered a problem in the form of a 302 redirect. Running a server header check (using a tool like this), I found a request for http://www.republicatrading.com is responded to with a 302 (temporary style) redirect to http://www.republicatrading.com/dev/index.php. That should have been a 301, or not redirected at all. The “Store Front” page lacked content and included a huge image and an “Enter” button. I thought we were past this stage in the evolution of website design. The bottom line is this: no content equals nothing for the search engines to sink their teeth into. The product pages were indexed in Google despite the spider-unfriendly URL structure generated by their Miva Merchant platform (e.g. http://www.republicatrading.com/mm5/merchant.mvc?Screen=PROD&StoreCode=R&ProductCode=Bogota&CategoryCode=). This was probably due to the tiny number of SKUs (eight). This became 25 unique URLs in Google’s index (according the Google search results because of duplicate page issues. In other words, many of the product pages are in Google multiple times at differing URLs (like http://www.republicatrading.com/mm5/merchant.mvc?Screen=PROD&StoreCode=R&ProductCode=Barcelona&CategoryCode=Eyewear versus http://www.republicatrading.com/mm5/merchant.mvc?Screen=PROD&StoreCode=R&ProductCode=Barcelona&Category_Code=). Product pages such as the above-mentioned URLs are missing critical keywords like “sunglasses” in the title tags and body copy. Overall, the body copy on product pages is sparse, and there are no H1 tags in use. Title tags across the site all start with the same throwaway copy, “|REPUBLICA| A destination site for the multi-ethnic way of life|” and are devoid of good keywords. With title tags, cut to the chase quickly, as unnecessary words dilute the keyword focus. Republica has a blog here. A pretty interesting read too. Unless you leave off the www and go to republicaupdate.com, in which case you’ll get to a very unpleasant GoDaddy “parking page” full of sponsored links. Yikes! Too bad some of the bloggers, like El Bohemio, left the www off in their links and linked to that parking page. Both the ecommerce site and the blog have underscores in the URLs separating keywords. A month ago I would have advised this was a problem and hyphens should be used instead. But times change! In previous columns, I warned against the use of underscores, because Google did not consider them word separators (this according to Google engineer Matt Cutts on his blog). I was pleased to hear Matt Cutts announce to us attendees in the WordCamp conference last month that Google changed its policy about underscores and now does treat them as word separators (which I blogged about in more detail here). Phew, that’s a relief for Republica! The meta keywords tag on the home page is way over the top, at 69 words in length. To make matters worse, many of the words are overly generic (e.g. “young,” “design”). This sends a signal to the search engines that the site could be spam. Take a look at this meta keywords list: republica trading, republica eyewear, republica sunglasses, republica sunwear, lentes republica, republica glasses, republica reading glasses, trendy, top clothing stores, latino clothing, US born, bilingual, hispanic market, hispanic, hip, shopping, fashion, hispanic shopping, ethnic, urban apparel, mi gente, tastemaker, 2nd generation, latin music, young, hispanic culture, latina, cool, latino content, television production, latin expolsion, video production, new york, entertainment, bicultural, hispanic entertainment, professional, international latino, latina, spanish, style, fashion, design. Hmmm. Drop at least 50 words, leaving only the laser-focused, highly-relevant keywords. Or delete them all, since meta keywords don’t improve your rankings anyway. 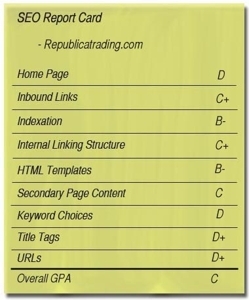 Want your site graded? Email seo@practicalecommerce.com.